How does a history book become part of the very history it speaks of? 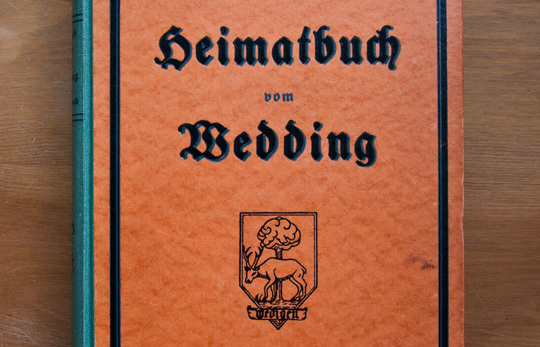 Front cover of Heimatbuch com Wedding. Amongst the books that inhabit my bookshelves, there are two that are historical accounts of the north Berlin district of Wedding. 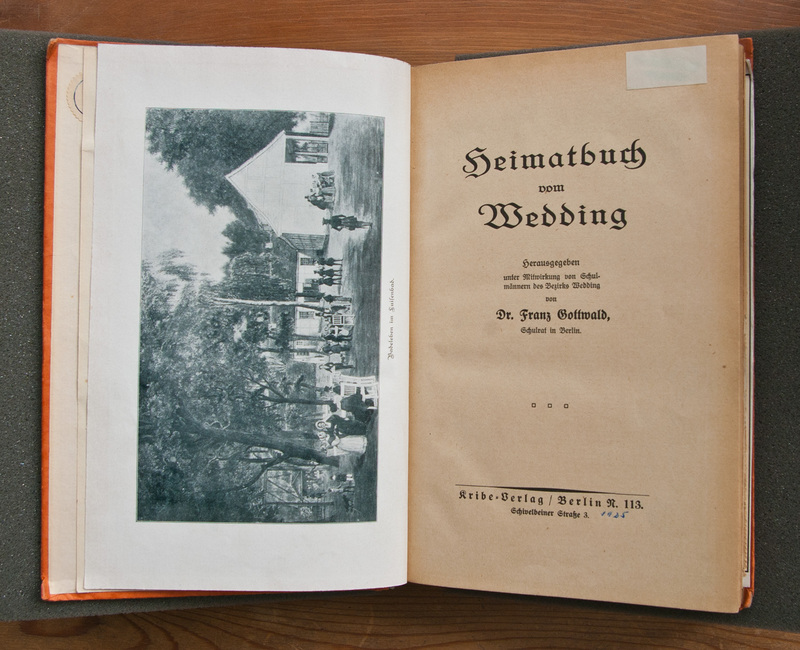 The first book is Franz Gottwald’s Heimatbuch vom Wedding, published in 1925. 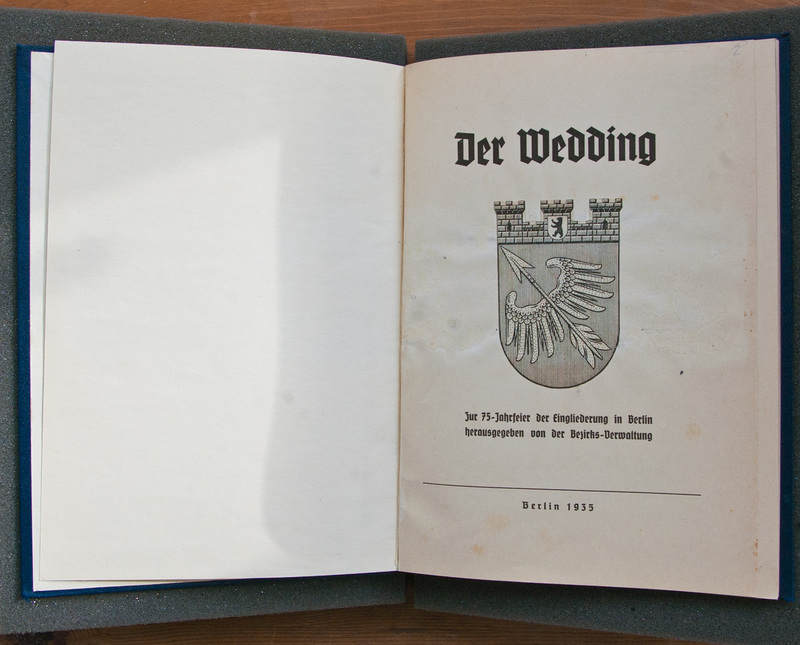 The second, entitled Der Wedding was published by Wedding’s municipal authority in 1935, to commemorate the seventy-fifth anniversary of the district’s incorporation into Berlin. Both were published in Berlin, both were at some point most likely owned by inhabitants of Wedding, and both were eventually brought by myself from Berlin-based second-hand bookshops through the internet. Just ten years separate the publication of these two books, yet the circumstances under which they were published could not have been more different. During the Weimar Republic (1919–33), Berliners frequently referred to the district of Wedding as Red Wedding, an allusion to the strong support that Germany’s Communist Party enjoyed there. Wedding was the most populous and industrialised of Berlin’s inner-city suburbs, and notorious for the poor living conditions that workers and their families had to endure in the district’s tenements. Throughout the latter part of the 1920s, the National Socialists focussed much of their activity on winning over Berlin (and Germany’s) working classes. Throughout this period, Wedding bore witness to countless violent clashes between Communists and Nazi supporters. In January 1933, with their seizure of power, the Nazis outlawed the German Communist Party and despatched many prominent Communist Party members to concentration camps. What happened next is familiar to most: twelve years of tyranny, from 1933 to 1945; devastating war; the division of the spoils (or spoil heaps) of Berlin between the Americans, Russians, British and French; the physical partition of the city with the construction of the Berlin Wall by Communist East Berlin in 1961; the Cold War; and finally, the city’s eventual reunification after the fall of the Wall in 1989. 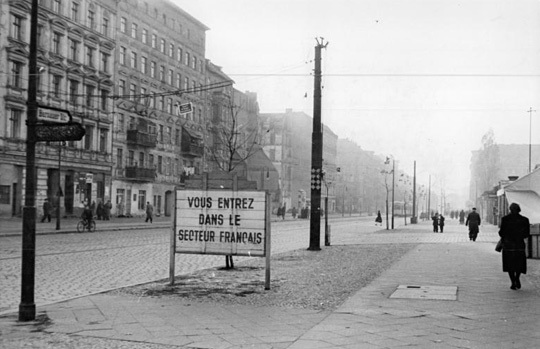 Border on Bernauer Strasse, 1955. Source: Bundesarchiv Bild 183-33809-0001 via Wikipedia. But these essential historical facts offer no real clues as to the experiences and impressions of those Berliners who survived the city’s destruction, only to find themselves enmeshed in a longer, more attritional war, that few did well to outlive. But, somewhere amongst the chaos and destruction that was wrought upon Wedding, whose Bernauer Strasse found itself on the fault line between East and West, these two books survived. Both owners did more than just keep their books, or leave them, forgotten, at the back of their bookshelves. Instead, and in response to events that were going on or had gone on in the streets outside, both owners altered their books, responding in a very direct sense to contemporary events. Frontispiece to Heimatbuch vom Wedding. The owner of Gottwald’s Heimatbuch altered his or her book by adding to it. He or she cut and pasted newspaper clippings into the front and back of the book. In doing so they augmented it, extending its story both back and forward in time, to create a unique historical record. Many of the cuttings are images of paintings and illustrations depicting Wedding at various points in its history. Other clippings, however, are newspaper articles, which have been dated in blue biro. Intriguingly, most of the cuttings date from the summer of 1961, documenting an eerie before and after of local events that took place in Wedding either side of 13 August 1961, the day the Communist authorities in East Berlin began construction of the Berlin Wall. 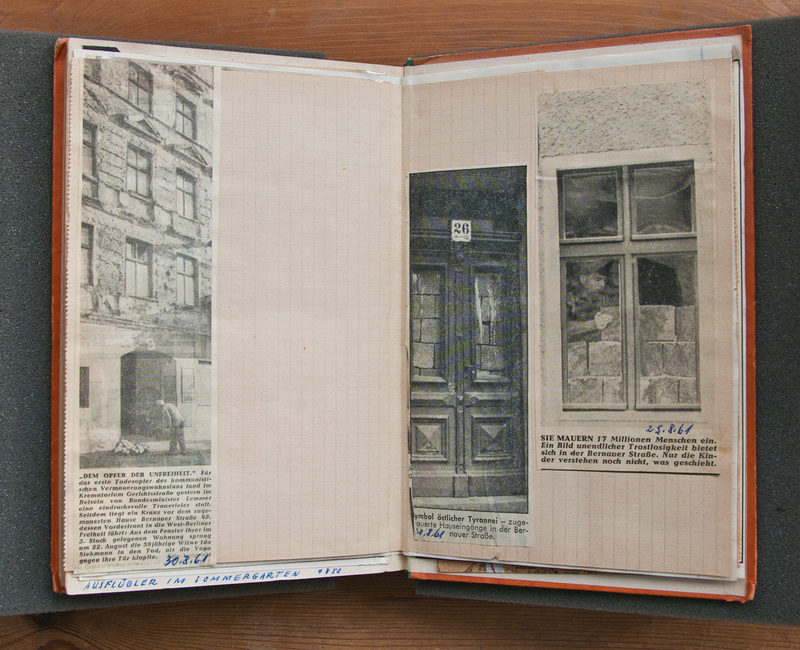 The cuttings juxtapose—in no particular order—funfairs and municipal ceremonies that took place in Wedding in the days and weeks preceding the beginning of construction of the Wall, with photographs of doors and windows being bricked up as part of the Wall, and a wreath laid outside the house of the first victim of the Wall, fifty-nine-year-old Ida Siekmann, who died after jumping from the window of a third-storey apartment on Bernauer Strasse on 22 August. 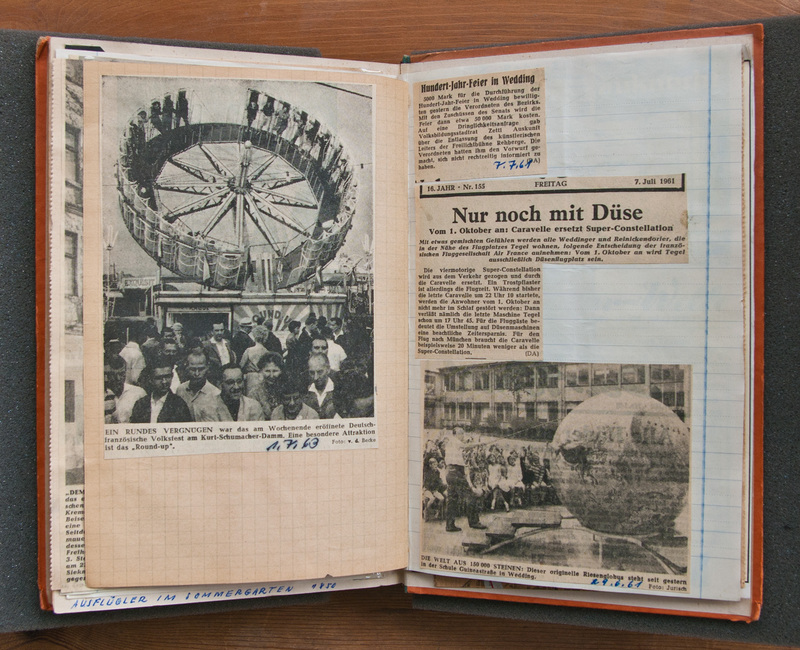 Newspaper cuttings in Heimatbuch vom Wedding, dated 29 June 1961, 1 July 1963, and 7 July 1961. Newspaper cuttings in Heimatbuch vom Wedding, dated 20, 25 and 30 August 1961. The owner of Der Wedding took a very different approach in their response to historical events in Wedding. 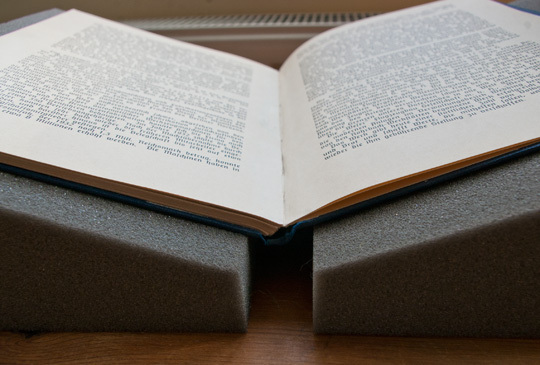 He or she altered their book by physically removing pages—no less than a whole chapter. The book has been rebound in an anonymous cover, and carefully repaired so that little evidence of the damage remains. However, I had encountered an intact copy of the same book on the shelves of the Zentrum für Berlin Studien in Berlin, and, on receiving this copy of the book through the post, I immediately became suspicious that it had been tampered with. From memory I recall that the removed chapter was specifically about the Nazi seizure of power in Wedding in 1933. Unlike the rest of the book, this chapter was was less objective and more triumphalist in its tone; in other words, little more than propaganda. Frontispiece of Der Wedding. Click on the image to enlarge. These books, then, are precious and unique documents. They are first-hand records of the traumatic events that occurred in mid-twentieth-century Berlin, and I feel privileged to own them.